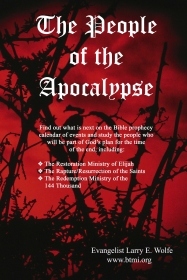 "The People Of The Apocalypse"
Bible messages describing the "Time of the End" circumstances and the people who are directly involved in the unfolding of the last days. The Lord's primary focal points of the End Times are His Church, His holy people the Jews, and His holy city Jerusalem. He will rapture His Church and send His prophets, along with the 144 thousand, to the Jews in order to bring to pass their glorious redemption. Learn how the Lord is unfolding His time of the End plan by finding answers to key prophetic questions in "The People of the Apocalypse".